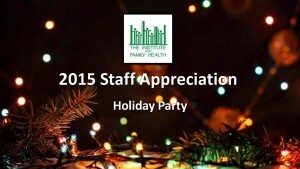 New York, NY (December 15, 2015) – Thank you to our generous sponsors who supported the Institute for Family Health’s Staff Appreciation Party held last Saturday evening. It was a wonderful event, attended by almost 900 employees and their guests. As you know, our staff works hard all year long to provide our patients with high quality, personalized care. At the holidays, we like to demonstrate our appreciation by providing dinner, music, and raffling off some wonderful prizes. Our sponsors helped to make that possible this year! The Institute has had a terrific year – graduating our first class of residents from its Harlem Residency in Family Medicine, a federally-funded Teaching Health Center and the only program of its kind in the historic neighborhood of Harlem. We were honored when the Ellenville Regional Hospital named its new pavilion housing a state of the art MRI unit the Neil S. Calman, MD Medical Arts Pavilion: Specialty Services Center. We also announced the expansion of our mental health services to 365 days a year, as well as the opening of an Early Childhood Mental Health Program in the Bronx. We are so very grateful to our vendors and consultants, who helped to show our staff how much they’re appreciated, and who help us achieve our goals on a daily basis. Below, please find the digital ad journal that was displayed on large screens throughout the evening. As promised, they have also been posted on our website. Thank you again, and warmest wishes for the holidays and New Year.